One of the many joys of doing historical research is reading the editorials and letters to the editor in historical newspapers (see also: Manawatu’s environmental past to be documented). People seemed to have been very free with their opinion on all kinds of things – not least of which the doings of government – and used sarcasm, dry wit and irony liberally and adeptly. “In travelling through the far famed Manawatu country in search of a piece of land for settlement, I was very much struck with the substantiality of some of the work upon the roads (bridges especially above Palmerston) that I cannot refrain from making a few remarks upon them. One would be led to believe, upon looking at the bridges, that timber was a very scarce commodity in the midst of a bush. They are generally constructed of small tawa sticks for bearers, covered over with slabs from half-an-inch to one and a half inches thick, and the bearers fastened down at each end with cross peg, sticking up from foot to eighteen inches high, I presume to keep the bridge from being washed away with floods, but more likely to trip a horse into the creek and break his rider’s neck. A letter to the editor to the Wellington Independent, Volume XXIII, Issue 2700, 30 June 1868. 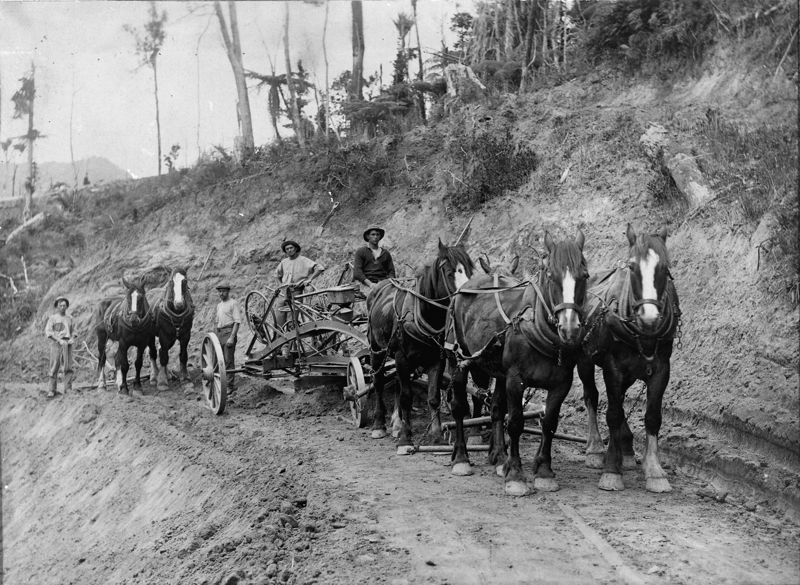 Photo: Road construction (from a later era), with horse drawn machinery and workers, 1916. Photographer and location unidentified. Not to be reproduced without permission from Alexander Turnbull Library, ref. ID: PAColl-6348-51. Previous Article When is a fence not a fence? You have to wonder about the story behind the story of the solo road worker. On the surface of it, it seems outside the scope of any rational programme.